Don’t look now, but it’s spring. I promise. I wouldn’t be writing this otherwise. And spring couldn’t come at a better time, unless of course you live somewhere warm all year long. After a long, long…long winter, it’s time for some well-needed spring cleaning. During the winter season, people may skip out on the chores from time to time because of a lack of energy. Everyone can breathe a sigh of relief and…start cleaning. Get out your mop buckets, water, and vinegar, and begin cleaning. You probably spend a lot of time in your room, so start there; however, don’t forget about the kitchen. Your kitchen should be the cleanest place in your house. It is, after all, the place you have very memorable moments with friends and family members, eating delicious and healthy meals. You want the kitchen to be at its best, and that starts with cleaning each area efficiently and placing each item in the proper areas of your kitchen. Think about rearranging your pantry and your refrigerator to reflect your healthy living mindset. You may have an abundance of healthy foods; however, are there some healthy foods your pantry is missing? Are there some food items that are unknowingly in the wrong spot? Are there some food items you should get rid of altogether? The best rule to follow is to toss any products that contain more than three unrecognizable ingredients. Trash your junk food such as those loaded with salt, sugar, high-fructose corn syrup, artificial colors and flavorings, as well as other food preservatives and additives. Food you’ve had too long should be tossed as well. Box all your unopened products and donate them to the local food pantry. Some products such as nuts, cookies, and cooking oils often don’t taste good after a year as well, and it’s best to trash these items. The unhealthy tossing includes your fridge as well. Look through your condiments and eliminate the chemical-riddled products. Many refrigerators are packed sky high with condiments and you find yourself barely making room for your vegetables. There are some fruits that are better to refrigerate such as berries, cantaloupe, kiwi, papaya, grapefruit, grapes, lemons, limes, and your dried fruit. It is best to organize your fridge where all the fresh and organic produce have room to breathe. Your food may go bad quicker if the fridge is too congested. 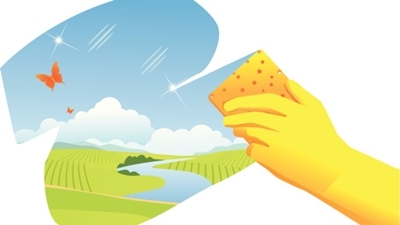 Spring Cleaning Tip #2: Eliminate the GMOs! If you’ve been storing extra virgin olive oil in the pantry for years, you may not have been reaping the benefits of that particular oil. There are many brain and heart benefits of omega-3 and omega-6 extra virgin oils; however, for these essential fatty acids to avoid oxidation it is best to store them in the fridge or a cold cellar if you have one. For your healthy living attitude, do your research on the best oils for your health. Oils with labels containing specific addresses help determine the authenticity of that oil. You won’t find the healthier oils on sale for $3.99. The healthiest oils to place in the fridge include extra virgin versions of olive oil, avocado oil, and flaxseed oil. Is white bread or whole grain bread just sitting in your breadbox? Your breads could even have quinoa, flaxseeds, or hempseeds and I would still ditch these breads when spring cleaning. Why? They may also contain GMOs such as soy or canola, which is common among conventional brands. You will get more nutrients from your sprouted grain products, and they are lower on the glycemic index, which helps balance your blood sugar levels. I love to spread almond butter on Silver Hills Sprouts Bakery products that are vegan, kosher, and without GMOs, oils, artificial preservatives, additives or stabilizers. My favorite varieties are The Big 13, and Mack’s Flax. They contain organic ingredients such as whole sprouted wheat, brown flaxseeds, and other sprouted grains like whole buckwheat spelt, and brown rice. Each slice will contain four to five grams of fiber and six grams of protein. Spring Cleaning Tip #5: Change Your Sweetener! Your typical refined white sugars and even brown sugars are depleted of minerals, and packed with calories and hormone-disrupting compounds. They definitely aren’t good additions to your coffee, tea, or baked goods. A better option is coconut sugar, which is also known as coconut sap sugar, coco sugar, or coconut palm sugar. They contain an abundance of minerals like magnesium, zinc, iron, and potassium, and come from the sap of cut flower buds from coconuts. The coconut sugar sweetener contains over 100 times more zinc, four times more magnesium, and twice as much iron than brown sugar. Could it be any sweeter? You keep your fructose consumption lower with coconut sugar; you also obtain more B vitamins, and it has a very low glycemic index of 35. Spring is in bloom, and now so are you. With your new and improved spring cleaning methods, your kitchen will shine bright and the freshness and natural feel from outside will also be reflected in your home. Clean wisely and surrender to a healthy and happy home. Pappa, A., “Spring Clean Your Pantry,” ACTIVE web site; http://www.active.com/nutrition/articles/spring-clean-your-pantry, last accessed March 13, 2014. Roehmholdt, R., “Steps to Spring Cleaning Your Health,” Yahoo Voices web site, March 13, 2013; http://voices.yahoo.com/5-steps-spring-cleaning-health-12047111.html?cat=5. “Spring Pantry Clean-Up: 8 Easy Natural Food Tips For A Healthy Kitchen!” Nature’s Emporium web site; http://www.naturesemporium.com/spring-pantry-cleanup-8-easy-natural-food-tips-for-a-healthy-kitchen/, last accessed March 13, 2014. “Spring Clean Your Pantry in 3 Simple Steps,” Kate Towell web site, April 30, 2013; http://www.katetowell.com/spring-clean-your-pantry-in-3-simple-steps. “Spring Clean Your Pantry, Spring Clean Your Life,” The Family Groove web site; http://www.thefamilygroove.com/mar10_MixedGreens.htm, last accessed March 13, 2014. “Is Coconut Sugar a Healthier Sweetener?” Andrew Weil, M.D. web site, Aug. 12, 2013; http://www.drweil.com/drw/u/QAA401323/Is-Coconut-Sugar-a-Healthier-Sweetener.html. “Non-GMO Shopping Tips,” Non-GMO Shopping Guide web site; http://responsibletechnology.org/media/images/content/ShoppingTips-2013.pdf, last accessed March 13, 2014. “Products,” Silver Hills Sprouted Bakery web site; http://www.silverhillsbakery.ca/products/, last accessed March 13, 2014.